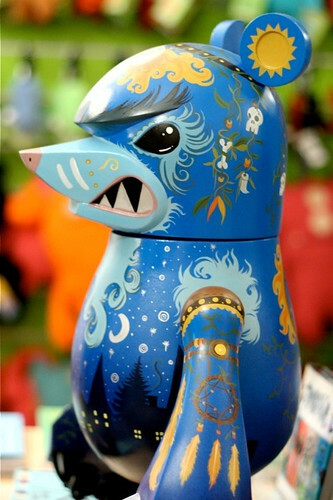 Lunabee: custom vinyl toy art: ARCAS Custom knucklebear for Iksentrik show! I had a great time at the Iksentrik show and met lots of fab people including the lovely Laura (Indescribble) and Ryan (Iksentrik's awesome owner) as well as getting to view all the other knucklebear customs in the flesh which were all breathtaking. It also made me very much want to move to Bath, such a beautiful place! Please check out the other Knucklebear customs too by Lunartik, Indescribble, Cris Rose, Jon Paul Kaiser, Triclops & Sour bones, they are all fab, I felt honoured to have my work amongst them, you can buy them here!